Don’t have the money to see the dermatologist? No day off to luxuriate at the spa? Here are seven acne home remedies that really work, and won’t put a big dent in your budget. Honey helps kill the bacteria that cause “pimple-like” eruptions on the skin. Home remedies may not give you perfect skin, but you can improve acne even on the tightest budget. Soap and water, used correctly, using the right soap, work for cleansing the skin. Lemon juice kills bacteria and stops inflammation when applied to skin, although some people should not use it. Honey kills the bacteria that cause “pimple-like” eruptions on the skin that are not actually acne. Mud—bought at the drugstore, not dug up in the yard or the in park—lightens oily skin. Water is an excellent moisturizer. Apply it before you apply makeup. There’s nothing fishy about eating fish for skin health. The essential fatty acids in fish and flaxseed oil are incorporated into sebum, and kill acne bacteria as the sebum breaks down. Simply avoiding chocolate sometimes reduces the number of pimples by up to 90%. Chocolate avoidance usually doesn’t cure acne, but it really helps. 1. Soap and water, used correctly. Bar soap is not an ideal remedy for blemished skin. Some soaps should never be used on blemished skin. An abrasive soap like Lava will only injure the walls of pores and push acne bacteria beneath the surface of the skin, replacing pimples with nodules. A fragrant soap like Irish Spring will trigger allergic reactions and shrink pores, forming a little prison for acne bacteria. And any floating soap like Ivory, and any soap that generates a lather of big bubbles, can break down the proteins in the skin by detergent action. This also just traps bacteria inside the skin, where they can do even more harm. But some soaps are generally safe for the skin. Neutrogena Transparent Facial Bar and Cetaphil soaps are gentle enough for all but the most sensitive skin (in which case no other soap will work, either). Wash your hands before you wash your face. Then make a lather of these soaps in your hands, and apply the foamy lather to your face. Let the lather do the work of cleansing your skin, and then rinse off with warm water, patting dry with a clean towel. Never rub your face with a washcloth or with a bare bar of soap—this can damage your skin. Soap is not an ideal solution for blemish care, but if it’s what you can afford, you can make it work. 2. Lemon juice, freshly squeezed. Freshly squeezed lemon juice sometimes works wonders for the skin. (Bottled lemon juice sometimes is just citric acid in water, and does not have any of the plant chemicals that help heal the skin.) The fruit acids in lemon juice break up dead skin that keeps plugs of waxy oil in pores, and they also stop the signals that acne bacteria send to the immune system to make it release chemicals that cause inflammation or irritation. Apply freshly squeezed lemon juice to a warm, moist cloth, allowing the cloth to rest on your face for 5 to 10 minutes. This opens pores so that whiteheads and blackheads soon clear on their own. Or take a fresh cotton ball and apply lemon juice all over your face. Then allow the lemon juice to dry own your skin, and rinse 15 to 30 minute later. Either way, lemon juice can loosen up sebum and also change the pH of your skin so that it is less sensitive to irritant chemicals that make it red or itchy. Don’t use lemon juice if you are allergic to it, and use with caution—don’t go out into the sun if you have lemon juice on your skin—if you have dark brown or black skin. Bees make honey from flower nectars they collect over an very large area. Hundreds of millions of trips to and from the hive and needed to keep the colony supplied with food, and each one of those excursions to collect food for the hive can also bring bacteria, molds, fungi, and yeast. Honey contains natural antiseptic chemicals that fight infections of many kinds, including the most common infections of the skin. 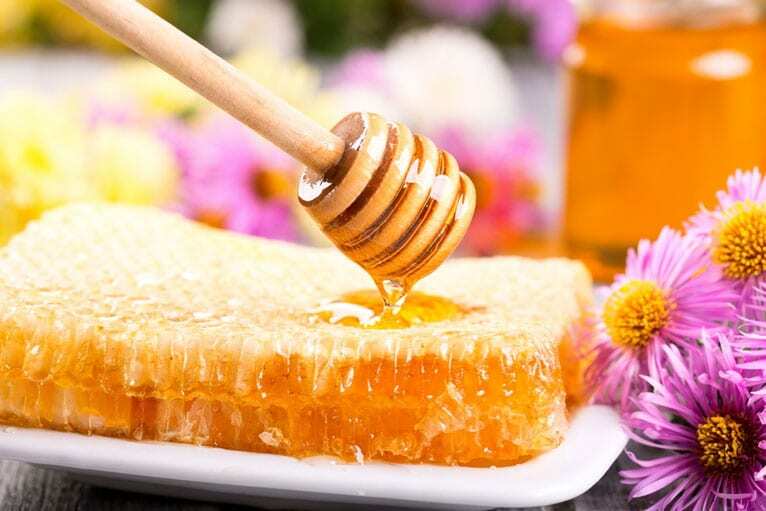 Honey is such a good antiseptic that many dermatologists use it as a cleanser before plastic surgery. Honey soaked gauze is also used as a dressing for burns and skin wounds. Wash and dry your hands, and pour out several tablespoons (about 50 g) of a particularly potent antiseptic honey like Manuka honey into a clean bowl. Apply the honey with your clean fingertips in a thin layer all over your face. Allow to dry for 15 to 30 minutes, and then rinse off with warm water, patting your skin dry with a clean towel. Honey is not especially potent for fighting acne bacteria. It’s great for fighting staph infections that can cause even meaner looking zits that have the small yellow circle of yellow pus in the center. There are lots of commercial products you can use to make healing facial masks to treat acne. The most expensive products can actually make acne worse. Anything that combines mud with essential oils or herbal extracts can irritate the skin. Sterile medicinal clay, however, just acts as a magnet to pull oil off the skin and out of pores. When you use a mud pack, place a thin layer of mud over the skin, either squeezing it out of the tube or mixing it as directed on the label. Let the mud pack dry until it begins to crack, and then rinse off with warm water. A warm glow to your skin indicates that it has worked, but you don’t want to use any product that causes noticeable redness, tingling, itching, or irritation. People who have acne need to moisturize the skin to keep pores open. There are lots of products to keep skin moist. Ironically, some alcohol-based “moisturizers” actually make the skin drier, and some oil-based moisturizers tend to clog pores on already oily skin. A good splash of water on the skin after you complete your cleansing routine, however, that you allow to dry on its own (rather than toweling dry), can increase the hydration inside your skin, at least temporarily, by up to 500%. Of course, an hour in the sun, or a few hours indoors in a room heated with a forced-air furnace or air conditioned without the use of a humidified, can necessitate another splash of water to your face. If you use makeup, be sure to moisten your face before you put on foundation and powder, not afterwards. 6. Dietary changes, especially eating more fish. Countries where cold-water fish is a staple of the diet, especially in the northernmost reaches of the Northern Hemisphere and in Japan, tend to be places where most people have beautiful skin. The reason may be that eating lots of fish provides lots of omega-3 essential fatty acids. Some omega-3 essential fatty acids are incorporated into the sebum that lubricates the skin. Exposure to the air or bacterial action causes sebum to break down and release the omega-3 essential fatty acids, which kills acne bacteria. This keeps the ecosphere that exists in every pore in balance. Acne bacteria feed on excess sebum, but the essential fatty acids released by sebum keep them from multiplying unchecked. You have to eat the foods that provide the omega-3’s, either fish or flaxseed oil, primarily. Don’t try smearing fish oil on your face. Your cat may find it endearing, but you won’t do your skin any good. 7. Dietary changes, especially avoiding dark chocolate. Many people who have acne love chocolate. Of course, many people don’t have acne like chocolate, too. In some individuals, however, the theobromine concentrated in dark chocolate (far more than in milk chocolate) can tremendously increase outbreaks of pimples on the skin. A study at the University of Miami found that eating three 2-ounce (56 g) dark chocolate bars in some cases caused as many as 80 pimples to break out in less than a week. If you must indulge in chocolate, at least try to avoid dark chocolate. These simple acne home remedies can make a real difference in skin care. But so can an acne care system like Exposed Skin Care. Herbal Acne Remedies: Do They Really Work?